Patients with end-stage renal disease (ESRD) die in the absence of renal replacement therapy (RRT). In developing countries RRT is not uniformly available and treatment often relies on conservative management and intermittent peritoneal dialysis (IPD). This study investigates the possibility of using acacia gum supplementation to improve the quality of life and provide children with ESRD with a dialysis-free period. Three patients referred to our hospital with ESRD during a 3-month period were enrolled in a therapeutic trial to investigate the efficacy of acacia gum (1 g/kg per day in divided doses) as a complementary conservative measure aimed at improving the quality of life. Inclusion criteria included a pre-dialysis creatinine clearance of <5 ml/min, current dietary restrictions and supplementation, at least one dialysis session to control uremic symptoms, absence of life-threatening complications, and sufficient motivation to ensure compliance with the study protocol. One patient complied with the protocol for only 10 days and died after 6 months, despite IPD. Two patients completed the study. Both reported improved well-being. Neither became acidotic or uremic, and neither required dialysis during the study period. Both patients maintained urinary creatinine and urea levels not previously achieved without dialysis. In conclusion, dietary supplementation with acacia gum may be an alternative to renal replacement therapy to improve the quality of life and reduce or eliminate the need for dialysis in children with ESRD in some developing countries. 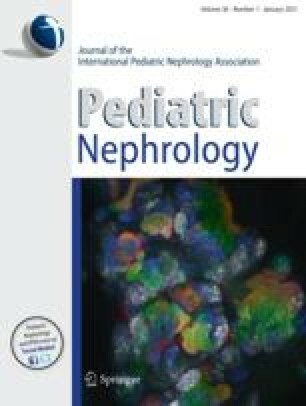 The author is very grateful to the editors of Pediatric Nephrology, with special thanks to Professor Otto Mehls and Ms. Andrea Patters, for their great help in the preparation of this paper. The author is also grateful to Dr. Donna Bliss for her kind, accompanying comments.